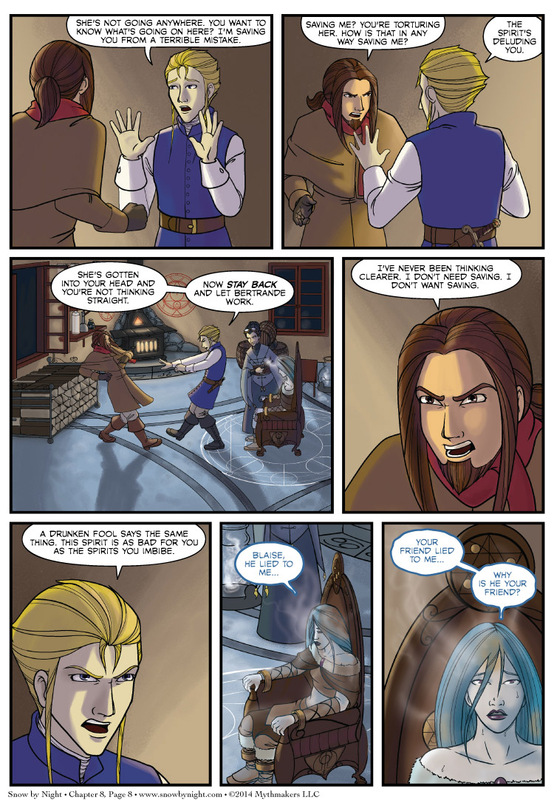 Jassart explains how this is all for Blaise’s own good on Chapter 8 Page 8. Blaise is having none of it. To see a preview of the next page, please vote for Snow by Night on Top Web Comics. Diane put together some lovely links for our stores on the landing page. The top one leads to our newly available PDFs on DriveThruComics. Larger images, no ads, and no load times for pages. All for $1.99. Waiting for Blaise’s superpowers to suddenly manifest and save Snow. Any minute now…right? Don’t need no superpowers. Just bullrush the harmchair out of the binding circle, and Snow can escape. Aha so she’s putting said aether in a lamp/vat on the bottom right. Bertrande is taking this on a personal level. And I’m waiting for Blaise to sucker-punch Jassart. This mostly looks like an old argument between those two. It makes me Wonder how badly Blaise’s drinking went at times. Did Jassart have to pull him from alleys and ditches before? The way Jassart is speaking, the way he is JUST AS certain as Blaise that he’s doing the right thing, seems to come from the fact that Blaise might nit have the best judgement in general. Heh. Jassart stepped into the circles. Stepping into (or worse, onto) the circles used to bind something that has reason to hurt you is traditionally a Bad Idea. Well, Bertrande is already inside the circle and she is fine… for the moment. Bertrande probably has some sort of personal protection as she has to get close to the subject to draw off the aether.